How Standard Deduction would lower tax outgo for Salaried and Pensioners? Budget 2018 though did not change the broad tax slabs but made some changes in the tax exemptions. One of them was reintroduction of Standard Deduction for salaried and pensioners. From FY 2018-19 (AY 2019-20) all salaried and pensioners would be eligible for standard deduction of Rs 40,000. However, as they say devil lies in details. With introduction of standard deduction, finance minister has removed two popular tax deductions which were available for salaried: Transport Allowance of Rs 19,200 and Medical Reimbursement of Rs 15,000. So, the net impact of standard deduction for salaried would only be Rs 5,800 (40,000 – 19,200 – 15,000). However, as pensioners did not have these allowances standard deduction for them is really good news. The table below shows the impact of standard deduction on salaried who used to receive tax free transport allowance and medical reimbursement till this year. As you can see in the above example the NET impact would be only Rs 5,800 extra tax exemption over last year. CBDT issues clarification regarding applicability of standard deduction to pension received from former employer. As per the amended Section 16 of the Income–tax Act, 1961, a taxpayer having income chargeable under the head “Salaries” shall be allowed a deduction of Rs 40,000/- or the amount of salary, whichever is less, for computing his taxable income. It is clarified that a taxpayer who is in receipt of pension from his former employer shall be entitled to claim a deduction of Rs 40,000/- or the amount of pension, whichever is less, under Section 16 of the Act. Standard Deduction for salaried was abolished in Budget 2005. Until then salaried individuals could claim Rs 30,000 or 40% of salary whichever is less for gross salary up to Rs 5 lakh. For salary of more than Rs 5 Lakh, the standard deduction was fixed at Rs 20,000. Many salaried had this question what proof would be required to claim standard deduction? The answer is there is NO proof or declaration is required for standard deduction. Its more in the lines of transport allowance where no proof was required. An added advantage with abolition of medical reimbursement there would be one lesser proof to submit to employer! Standard Deduction for Family Pension? The rules for standard deduction is clear for Pensioners but what happens after the death of pensioner? After death of pensioner the legal heir (Spouse, children below the age of 25 years, unmarried daughter and dependent parents in certain cases) continue to receive pension. This is referred to as “Family Pension”. 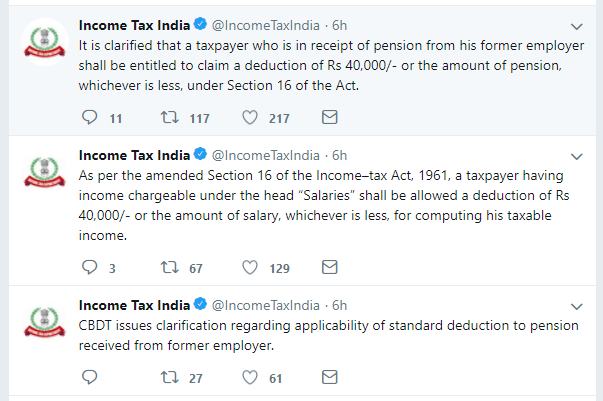 Also in case of normal pension the income is part of salary in ITR, however in case of family pension the income is considered from other sources. So the above standard deduction of Rs 40,000 proposed in Budget 2018 would not be applicable to family pension. However for family pension, a standard deduction u/s 57(iia) is available under which an amount of Rs 15,000 or 1/3rd of the uncommuted pension received, whichever is less, shall be exempt. For Example, if a family member receives a pension of Rs 50,000, the exemption available is least of Rs 15,000 or Rs 16,667 (1/3rd of Rs 50,000). Thus, the taxable family pension will be Rs 50,000 – Rs 15,000 = Rs 35,000. Do EPF/Insurance Pension get Standard Deduction? 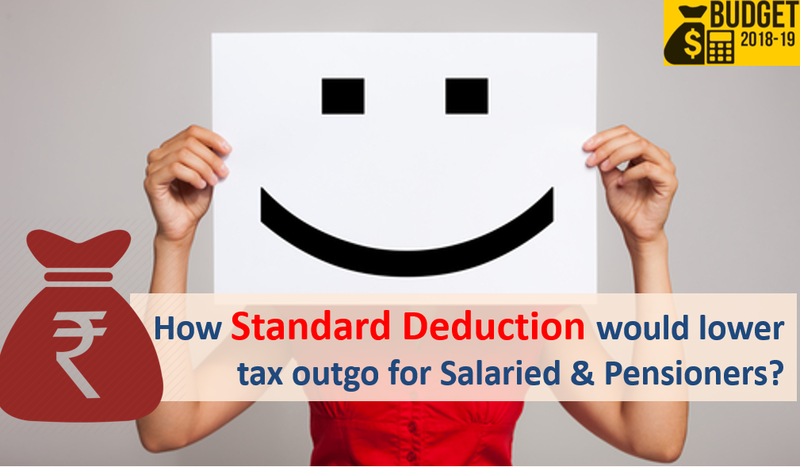 The standard deduction provision is clear for salaried and for people receiving pension from their ex-employers. But what about investors receiving pension from pension plans they invested? Well they would not be eligible for standard deduction. Standard deduction was long demanded by salaried and getting it in this Budget was good. This would help salaried save a bit more tax while for pensioners this would lead to tax saving up to Rs 12,500 in highest tax bracket. Sir, I am getting Fixed Travelling Allowance in my monthly salary at the rate of 1000/- PM. Should I have to take rebate in income Tax on FTA i.e. 12000/-? I am also taking rebate on standard Deduction Rs. 40000/-. My mother is receiving a salary and also a family pension. Can she availe both benifits that is standard deduction and 1/3 or 15000 deduction from family pension.